Episode 114: What is an Inbound Persona Strategy? Personas are one of the fundamentals of inbound, shaping not only your marketing and sales efforts but all levels of your company. So, what is a persona? Personas are semi-fictional representations of your ideal customer based on actual data and some speculation about things like demographics, behavior patterns, and goals. Personas represent a person, not a company or market! 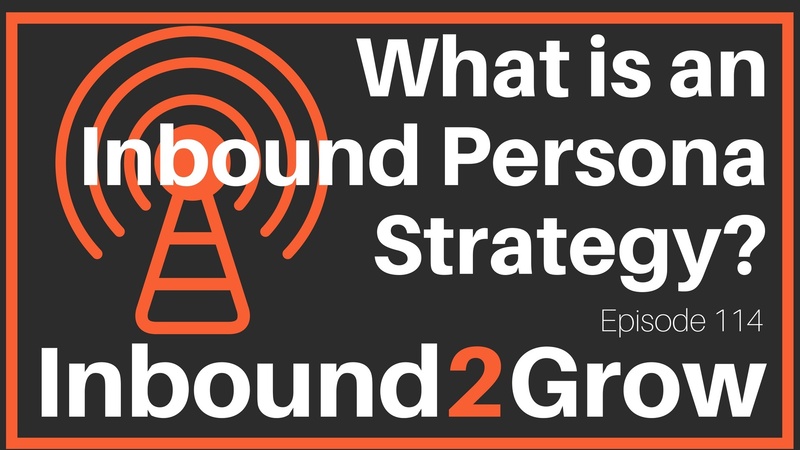 [0:40] Question: What is an Inbound Persona Strategy? It is important to understand that personas are created through research and data. By interviewing current customers and prospects, reviewing user data, and speculating (based on your research and data) about behaviors and goals you create a complete view of your ideal customer. You might know some things about the type of organization they work for, but your persona work creates a picture of the actual person who is your customer, not their organization. Personas are a vital part of an inbound organization because they give focus and meaning to the work you are doing. Rather than marketing or selling a product to a particular type of company you know happens to buy that product, personas allow you to understand and help solve the problems of the specific person who has a problem. Put another way; personas allow you to think persona to person (H2H) and create content and speak directly to your buyer, not your buyer's company. Personas put your work into context and allow you to understand your buyer on an emotional level, grounding your company in market reality. It used to be that the focus was on what customers bought not why they bought. In today’s market, however, no one wants a generalist. If you want to stand out and have a competitive advantage, you need to know why people are buying and meet them where they are. You need to find your niche and personas are how you do that. Buyer personas are critically important. Dan wants you to go to HubSpot’s persona tool (Make My Persona) to learn more about personas and make your own. And, if you send us your persona, Dan and Todd will review it! Your buyer persona is a representation of the person that your organization helps the most! From now until the end of August we are holding an MSPOT contest! You can download the MSPOT template, submit it for review, and from now until the end of August anyone who submits an MSPOT will be entered into the contest. The first place winner will win an hour to review their MSPOT with Todd and Dan!